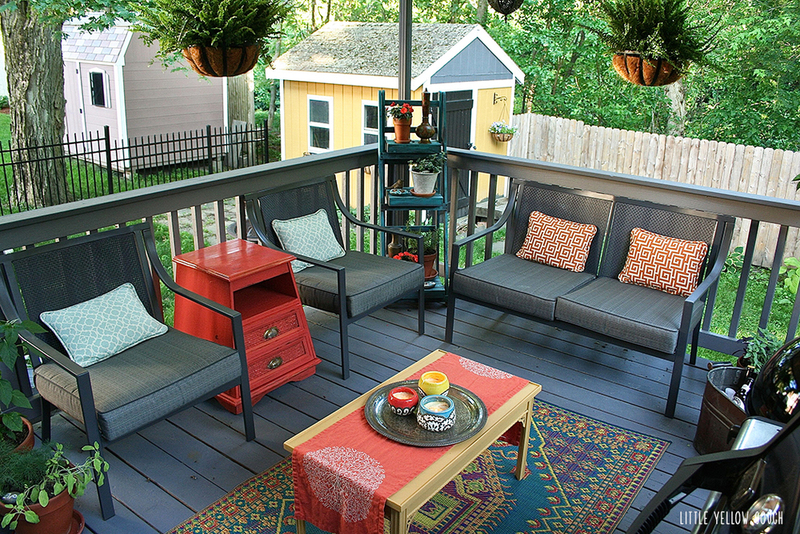 Our back deck has been in need of a makeover but we have been pushing it off due to the expense. Outdoor furniture can cost a fortune and in New England our season for outdoor living is fairly short. However, because it is short we want to make the most of it. So I did a ton of research and figured out the best way to get the most bang for our buck. And of course, that means tackling as many DIY projects as I can get my hands on! My first step was to find the core pieces of furniture. I hit many of the big box stores online and in person to get an idea of what was out there and how cheap I could go without worrying about screws popping out of my chair while I sat on it. I also wanted furniture that had a fairly neutral feel, so that I could dictate the rest of my design with accent pieces. I finally settled on the Alexandra Square Collection from Walmart. For just under $300 and free in-store delivery, I couldn't pass it up. The online reviews were great and we were pleasantly surprised with the quality when it arrived. With a little bit of time, we had the set assembled and set up on the deck. Now this is the part where I get excited... I love transforming something that's seen-it-everywhere matchy matchy into something that feels like me. Check out the before and after shots below to see how I translate Walmart into "Karen June." Just switching out the pillows that came with the set makes it feel less like it all just came out of a box. They can easily be recovered with the large selection of outdoor fabrics you can find at your local sewing shop or online. I went with spiced orange Greek key and turquoise Moroccan style lattice designs. Hanging plants give height to your space as well as a sense of privacy. I picked Boston Ferns and took them out of those ghastly plastic containers they come in! Add an outdoor rug to your space. This rug is made from woven plastic and is a colorful nod to a more traditional design. A Moroccan lantern adds a bit of surprise to the space and casts some decorative patterns when lit at night. Bring some foliage into your space. Container herb and vegetable gardens are a great way to add a bit of nature and contribute to your summer meals. Colorful vessels holding citronella candles not only bring in more pattern and color, but are a necessity for keeping those pesky bugs at bay. Adding an additional side table to the set infuses a bit of color and breaks up that matchy matchy quality. I picked up this piece at my local thrift store a few years back, but added some paint and shellac this year to brighten it up and keep it water resistant. Switching out the glass topped coffee table for one that's made of wood makes the space reflect my own sensibility rather than the aesthetic of a big box store. I picked this piece up for $10. A little elbow grease, some time with my palm sander and two coats of paint later, I have a table that makes me feel like I'm in an outdoor "room." A plant stand also adds height to your space and is a great place to display smaller plants and other collected objects. Don't forget a place to keep your drinks cool during the hot summer days. This vintage copper bin adds a bit of a rustic edge and is much nicer than a plastic tub. For the final flourish, my husband chose this hibiscus tree and I love the pops of color provided by the blooms! Let us know if you do your own outdoor living space makeover. Don't forget the "before" photos...we get a kick out of seeing transformations!